Genealogy & Family History Researcher Warwickshire | Genealogy / Family Tree and Local History Research. Genealogy / Family Tree and Local History Research. Welcome! I’m Katie Carr, and for more than thirty years I’ve been tracing my own and other people’s family histories. I’d be delighted to hear from you if you’d like my help to find out more about your own ancestry. I’m based in central England, in Shakespeare’s beautiful county of Warwickshire, and have a particular interest in the Midlands, but often work much further afield. As well as the research itself, I produce art and craft items related to individual families and places – please take a few minutes to look around my website. I love September. The leaves turn, the air is full of autumnal scents, and the children go back to school! So – I thought I’d talk a bit about educational records and how they can help you in your family history research. Sadly, many old school records have ended up on bonfires or have simply rotted in cupboards. Unless your ancestors were sufficiently wealthy or well-bred to attend one of the larger Public schools, whose records are usually very comprehensive, you may be lucky even to identify the local schools your ancestors might have attended. If you can pinpoint the village or area where your ancestor lived as a child, it’s always worth checking to see whether any local school records survive – usually at the relevant Archives / Record Office. 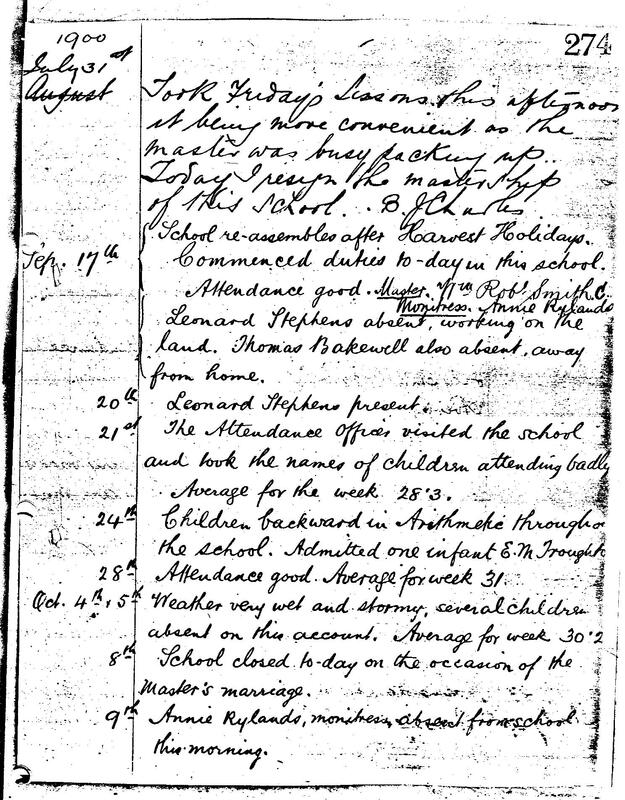 From the early 1860’s all schools in England were required to keep log books, and many of these include notes about individual pupils, the syllabus, local events, and major issues such as the spread of contagious disease within a community. Those which survive make fascinating reading – and even if your own ancestors are not named, the log books will give you a vivid impression of what their schooldays would have been like. I was fortunate to find one of the log books kept by my great-great-uncle, a schoolmaster working at the turn of the century. The excerpt below not only gives the names of various pupils but records key events including, on October 8th 1900 – ‘School closed to-day on the occasion of the Master’s marriage’! Ancestry.co.uk – the UK’s largest family history site.